14 May 2012 | Last year’s Innovative Airlines ranking awarded All Nippon Airways (ANA) with a second place thanks to its ‘Inspiration of Japan’ cabin and service concept, the opening of a new international terminal at its Tokyo Haneda hub, its business-class only ANA Business Jet service, the MyChoice ancillary revenues program, as well as passenger-friendly amenities such as women-only toilets onboard, sleep support kits on late night departures, and wireless mobile phone chargers in its domestic lounges. Aiming to fill the void left by the restructuring of Japan Airlines, ANA – which is currently the ninth largest airline in the world by revenues and the largest in Japan by passenger numbers – seeks to become one of the major airlines in Asia. Cornerstones of this ambitious strategy are plans to expand international capacity by 22 percent in the next two years by capitalizing on its new Boeing 787 Dreamliners, of which it will have 20 in operation by March 2013. Furthermore, the airline is targetting new customer segments by launching two low-cost carriers in 2012. The first airline to receive the B787 Dreamliner in September 2011, ANA so far has received the first six aircraft of 55 B787s on order, which it says is key to its expansion in Asia and Europe. 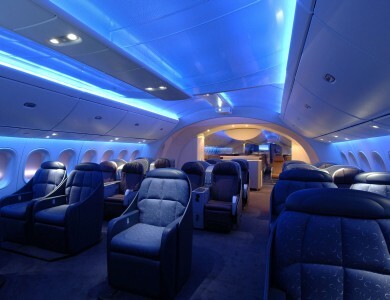 The 787 is a twin-aisle airplane that can accommodate up to 250 passengers on flights up to 8,200 miles (15,200 km). As the first large passenger jet to have more than half its structure made of lightweight composite material instead of aluminum, the fuel-efficitnet 787 is the only mid-size airplane capable of long-range routes, making so-called ‘thin routes’ economically viable. 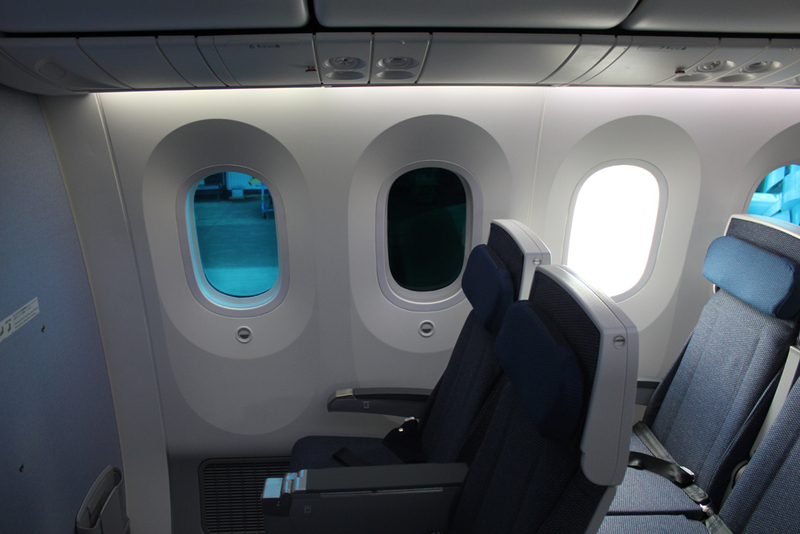 The interior of the 787 Dreamliner provides passengers with a more spacious experience than on other twin-aisle planes, because of a ‘vaulted’ 8-foot ceiling, large windows with electronic shades, while passenger comfort is improved by higher levels of humidity and maintaining air pressure at the equivalent of an altitude of 6,000 feet (1,800 meters) in comparison to 8,000 feet on other aircraft. ANA’s 787s feature the airline’s ‘Inspiration of Japan’ cabin (launched in early 2011) and have two classes – Business and Economy. The capacity ranges from 158 seats (46 full-flat Sicma Skylounge business seats, 112 Sicma AIRgonomic FX seats in economy) for aircraft flying long-haul routes to 222 (42 Sicma cradle seats in business, 180 economy) on short-haul routes. 7 October 2011 | Following earlier initiatives by Alaska Airlines and United who are supplying all their pilots with company iPads, ANA will become the first airline in the world to provide all its cabin attendants with the device. The Japanese carrier said it will arm each of the company’s roughly 6,000 flight attendants with an iPad tablet in a move to reduce training costs by about JPY200 million (USD2.6 million). The use of iPads instead of traditional paper training manuals will cut down on printing and distribution costs for ANA, as well as make sure that staff will be able to access the latest information. During training, ANA flight attendants are required to constantly carry the bulky training manual with them (also on flights), which weighs about 2.1 kilograms and consists of around 1,000 pages over three volumes. The manuals also have to be updated and reprinted several times a year. Furthermore, with the roll-out of the 0.7kg iPad, ANA will move away from centralized training and provide self-taught lessons on the iPad instead. For example, cabin crew will be able to download videos teaching the correct way to serve a meal to travelers and how to handle emergency situations. ANA says it anticipates that cutting the need for staff to physically gather for tutorials will significantly slash training time, as e-learning will make the training process easier and shorter because crew members can study at any time and in any place. Approximately 700 cabin attendants will begin trialing the iPad from October 2011 before full roll out in April 2012. 23 January 2011 | Runner up on our list is Japanese airline All Nippon Airways (ANA), which has stepped up its international expansion and has been courting business passengers with an improved product at a time its major competitor JAL is in the middle of a restructuring. The opening of Tokyo Haneda’s new international terminal in October 2010 and the trans-Pacific joint venture with United/Continental also has given ANA an opportunity to capitalize on its large domestic network out of Haneda. In April 2010, ANA introduced a serious upgrade of its four loung-haul cabins as part of a new ‘Inspiration of Japan’ programme. The new interiors were originally meant for the airline’s B787s (ANA is the launch customer) but due to the delivery delays – ANA’s first 787 will now be delivered in the third quarter of 2011 – the new cabins have been installed on ANA’s B777-300ER fleet instead, and are currently available on services to New York, London and Frankfurt. ANA’s new first class, renamed ‘First Square,’ features a private suite with a full-flat bed, a 23-inch LCD touch screen and an individual coat closet. At both Tokyo Haneda and Narita airports, First Class passengers can also work or relax in their own private pod, dubbed ‘ANA Suite Lounge,’ as they get checked-in and wait for their flight. ANA’s new Business Class also offers a full-flat bed in a staggered 1:2:1 configuration which gives all seats unrestricted aisle access. Further raising the bar, ANA offers First and Business class passengers travelling round trip from Japan to North America or Europe a ‘welcome-home’ helicopter or limousine transfer to central Tokyo. 19 July 2010 | Airlines are increasingly making an effort to use fresh ingredients in their in-flight meals, or try to figure out ways to prepare parts of the menu freshly on board. For example, ANA, JAL and Cathay Pacific serve freshly cooked rice in-flight, using an onboard rice cooker. Cathay Pacific long-haul aircraft also have a toaster oven and an espresso machine on board, while kitchens on SWISS aircraft and Lufthansa’s new A380 are equipped with an in-flight Nespresso machine. 2 March 2010 | All Nippon Airways (ANA) has introduced women-only lavatories on its long-haul flights. One lavatory has been designated in the rear section of the passenger cabin and is available to female passengers from all classes. The bathroom will display a pink version of the universal sign for a ladies’ room as a way to let male travelers know to look for another option. Men are allowed to use the lavatory only in emergencies or when there were very few female passengers on the flight. Women can still use any other lavatory. ANA decided to designate a ladies-only lavatory based on a 2007 online survey in which 90 percent of the women polled said they favoured such a service. Demand for women-only toilets was especially high among passengers taking long flights. As to why women travellers want female-only toilets, ANA says they are tired of long queues for the lavatory. A handful of women also told the airline they won’t queue up for a toilet if there are men in the queue. Interestingly, ANA says 70 percent of male passengers surveyed say they don’t mind it, and some even welcomed the idea because it means less time queuing up after the ladies for the toilet. 18 February 2010 | Japanese carrier ANA is just about to open an upgraded First Class lounge at Tokyo Narita Airport for First Class passengers and ANA Diamond Members. Rebranded as the ANA Suite Lounge, the highlight of the new lounge are personal private rooms where passengers can work or relax while they get checked-in and wait for their flight. The ‘pods’ come equipped with a workspace, leather-covered chairs and 32-inch personal TVs, and aim to provide similar privacy on the ground as in ANA’s new First Class suites up in the air. Scheduled for Autumn 2010, ANA will also open an exclusive check-in service for First Class and Diamond member at Narita. The private lounge suites also resemble an upscale version of the cubicles found in Internet and manga-cafe’s popular throughout Japan. Rent-by-the hour private restrooms have also been recently introduced in the U.S at Atlanta airport. 4 November 2009 | All Nippon Airways (ANA) has introduced a new ancillary revenue program, called ‘MyChoice’. The idea behind ‘ANA My Choice’ is to offer Economy passengers paid access to services that were previously only available to business class passengers. The program starts on December 1 with a limited number of paid-for services and ANA says it will introduce more services during 2010. On the ground, ANA Economy passengers can purchase access to ANA’s airport lounge at Haneda for JP¥5,000 (USD55/EUR40).The introductory fee until the end of January 2010 is 4,000 yen. On board, light Business Class meals, such as a rice ball and miso soup set, are available for sale to Economy passengers for JP¥500 (USD5.50/EUR4) until the end of January, then the regular fee is 700 yen. Also, business classs wines and shochu (a strong liquor) will be sold for the introductory price of JP¥800 (USD9/EUR6) per glass (regular fee is 1,000 yen).